A lot of people will claim – rightly – that your abs get a good workout during almost every weight training session, even if you don’t train them directly. That’s because your abs support your torso and transfer power output between your legs and upper body when doing the big compound lifts (squats, deadlifts, overhead presses, pull-ups and dips) that should make up the bulk of your gym sessions. 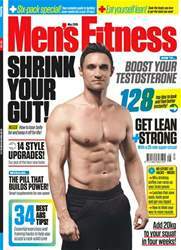 But to fully develop your abs into a bona fide six-pack, you need to make them work as hard as possible. And that means targeting them directly with some dedicated core workouts. That’s exactly what the three workouts on the following pages will do. 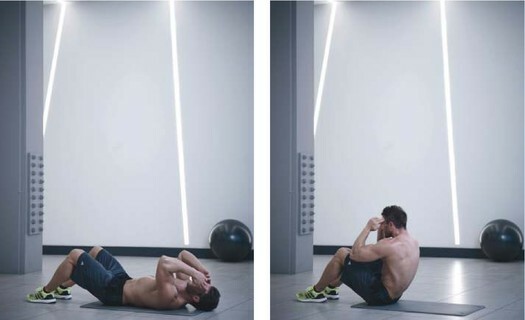 Over the next six pages you’ll find three abs sessions. Each is unique in a few crucial ways, but the most significant difference is the kit used. The first uses your bodyweight only, so you have no excuse not to do this one even if you can’t get to the gym. The other two use a gym ball and a set of dumbbells respectively. The other major difference is the session make-up, with supersets, trisets and straight sets all featuring. Either pick one of the workouts and do it a couple of times a week, or try to do all three workouts in a week, either as stand-alone sessions or bolted on to the end of your normal workout. The beauty of this six-move superset bodyweight workout is that you can do it anywhere and any time to work your entire core hard to start sculpting a solid six-pack. Lie flat on your back with your knees bent and feet flat on the floor, with your hands at the sides of your head. Engage your abs, then raise your torso off the floor as high as you can. Slowly lower back to the start. BONUS TIP In the top position, hold for a second or two to fully contract your upper abs This extra tension will go a long way towards building harder and more defined muscles. Lie flat on your back with your hands at the sides of your head and your legs straight. Use your lower abs to draw your knees towards your chest, then raise your hips off the ground. Lower back to the start. 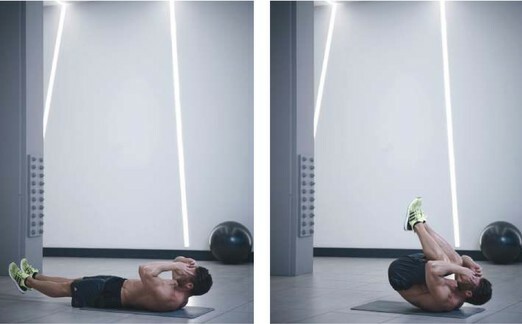 BONUS TIP As with the previous move, hold the top position for a second or two and concentrate on tensing your lower abs as hard as you can to work even more muscle fibres. Lie flat on your back with your hands at the sides of your head and knees bent with feet off the floor. Use your upper and lower abs to raise your elbows and knees so they meet. Then slowly return to the start. BONUS TIP You can make the move slightly harder by not allowing your upper back to touch the floor between reps, or make it slightly easier by allowing your feet to rest on the floor between reps. This six-move workout is split into three supersets. Do all the reps of move 1A, rest for the allotted time, then do all the reps of move 1B and rest as indicated. Once you’ve done all the sets of 1A and 1B, move on to the next superset and perform it in the same way. Repeat until the workout is completed. Lie flat on your back with your legs straight and your hands either by your head or under the small of your back. 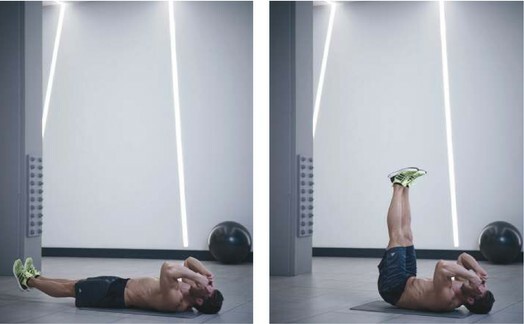 Engage your abs, then raise your feet as high as you can. Lower slowly back to the start. 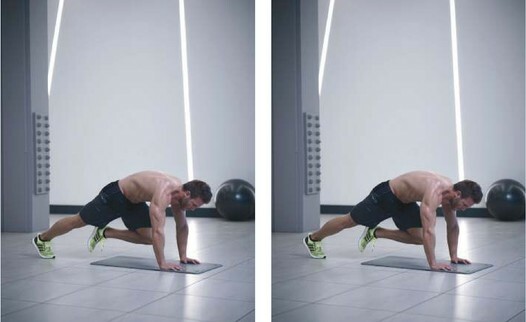 BONUS TIP As with the previous move, you can make the exercise work your lower abs even harder by not allowing your heels to touch the floor between reps.
Get on all fours with your legs straight and wrists under your shoulders. Without letting your hips sag, draw one knee forwards, then back to the start. Repeat on the other leg to complete one rep. Continue, alternating legs. BONUS TIP Help prevent your hips from sagging and maximise muscular tension across your entire core by keeping your abs engaged throughout, and keep the reps fast but controlled. Get into position, supporting yourself on your forearms. Engage your abs, then raise your hips. Hold this position by keeping your abs and glutes engaged to prevent your hips from sagging. 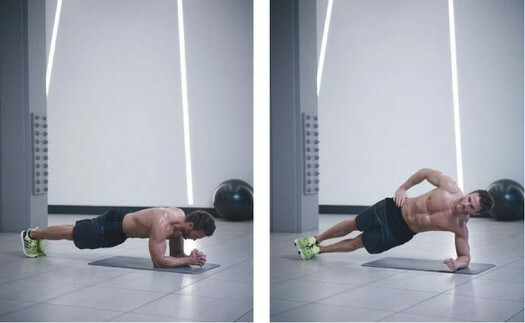 BONUS TIP After the 30sec plank go straight into the side plank for 30sec, resting on your left forearm, then switch to do 30sec on your right forearm. Then rest 60sec and go back to move 3A.